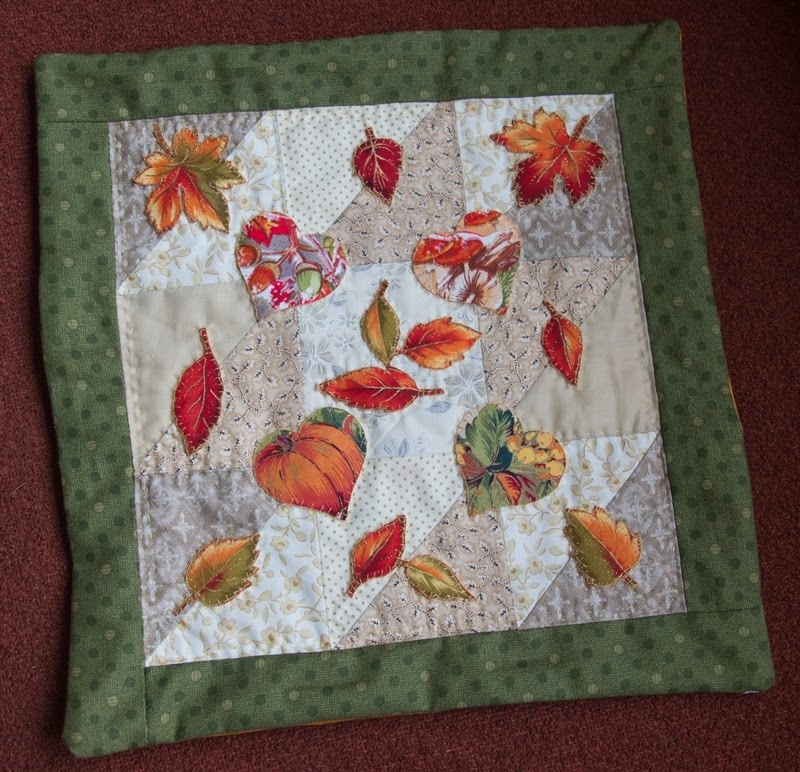 October 2013 – I made a mini table top for the occasion of my friend’s birthday: she is a nature lover, runs her own B&B, and lives almost in the street around the corner. She did not have any wishes for her birthday, other than hiking with friends for charity – to collect money for the Dutch Cancer Society. 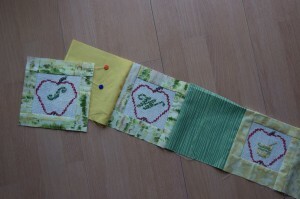 But I could not resist to make a her a little table-runner in Autumn-style. I was so lucky to be able to make a trip to the USA in October, and visit with my friends Kathy and Jon prior to the NMDP Council Meeting. 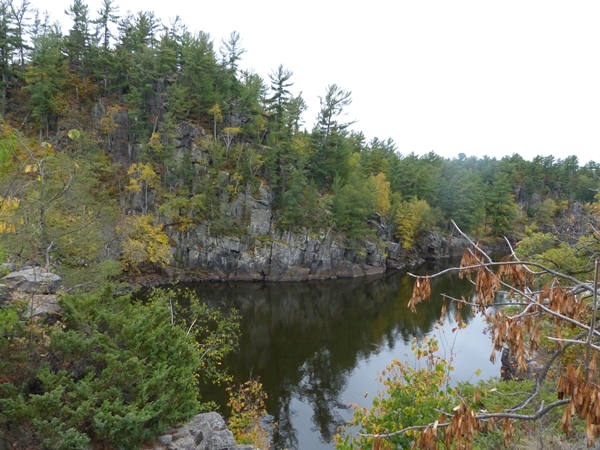 We had such a great time together, did some hiking and sight seeing (We drove to Stillwater, the Birthplace of Minnesota), a lot of shopping (fun! 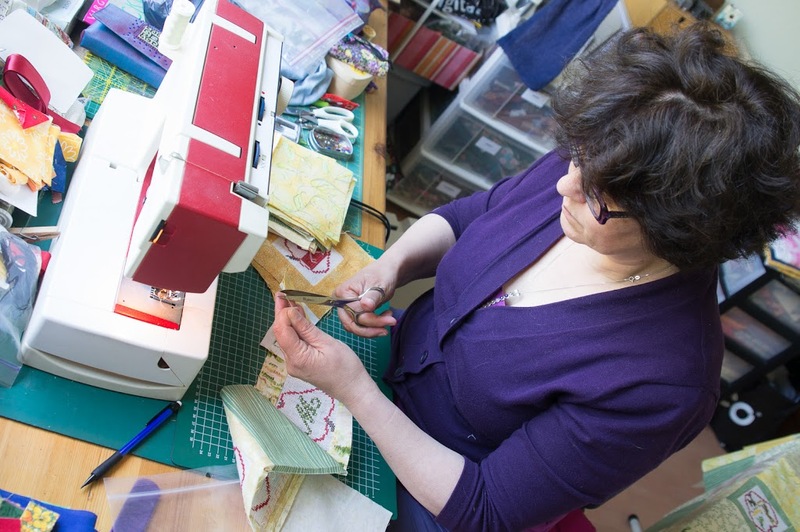 ), pedi’s and mani’s, and she organized a ‘fabric-shop-hop’ in and around Minneapolis for me. Load’s of new fabric and idea’s to bring home with me. We will definitely do that again! November 2013 was a special month, a month to remember. 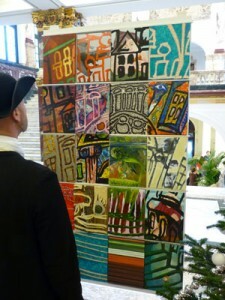 The weekend exhibition of the KadK– group was planned for November 22-23-24, all art works were based on the theme ‘Music’. 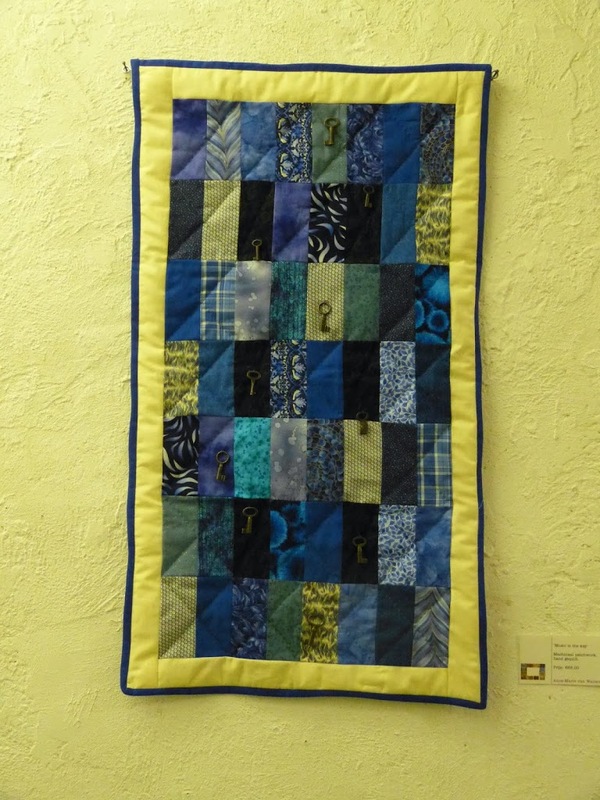 I borrowed the “My Rhapsody in Blue’ quilt that I made for Florian earlier this year, and made two new small wall-hangings. 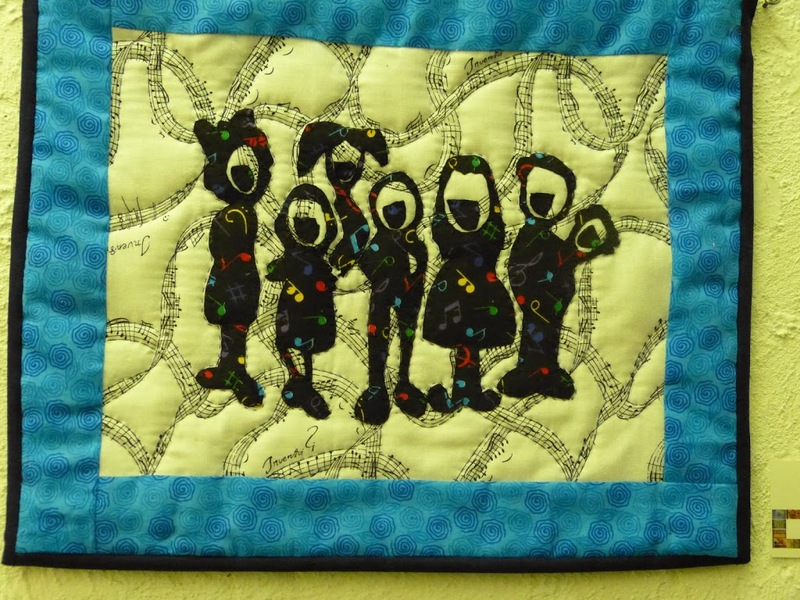 ‘Falalala’ is patchwork and application, hand quilted, showing a children’s choir. It was fun to make. And…it was sold! 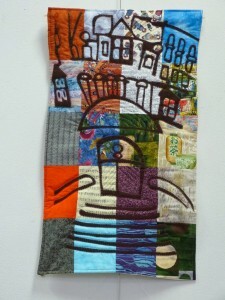 The second work was more traditional with bricks in blue, and a bunch of small old keys attached to a number of bricks. It is named ‘Music is the key’ and is hanging in my office since the exhibition. The month ended with a special day, a memorable moment, we have been looking forward to: the graduation of my youngest daughter Leonore. Since November 29th, she is officially MD. She started working in the pediatrics department as of January 2014, and I feel very grateful! 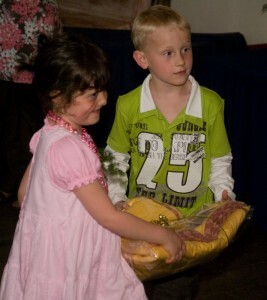 We had a nice party, celebrating her gradutation and my 55th birthday with friends and family. Since life (work) has been so busy, my quilt blog hasn’t been updated. But one thing I have decided recently is to spend my out of office time doing things that bring joy and relaxation. In practice it will mean that the piles of books and articles that I have gathered for the final chapter of my thesis will last a little longer in our living room. But the change I made will bring me more inspiration and energy to fix this last chapter! 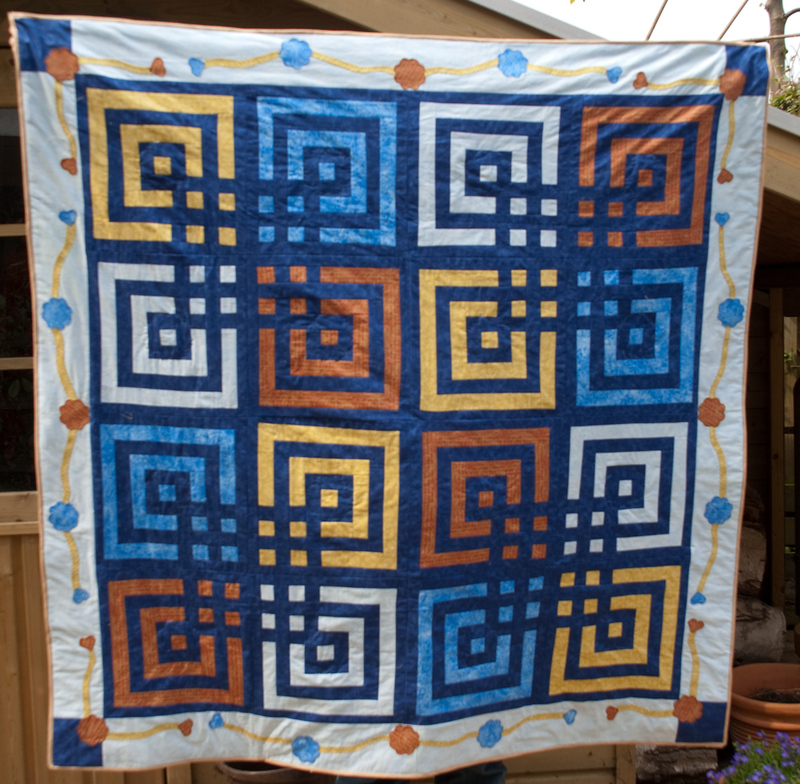 Enough about work, what happened in my quilt room lately? 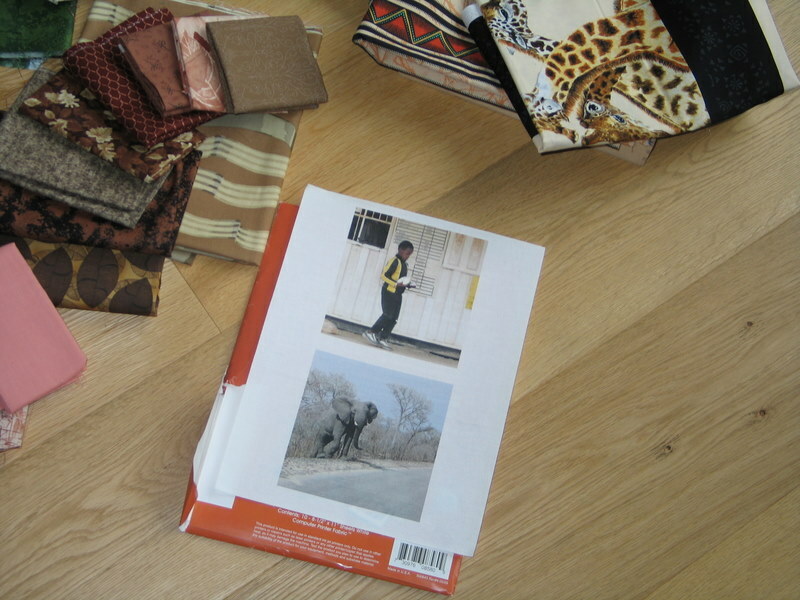 Last year I started with projects for the exhibition of the Kunst aan de Kade group (Art at the Quay) in March. 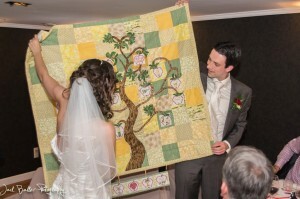 The first quilt was made on the occasion of the wedding of our friends John and Peter. Peter is a founding member of the KadK group and the quilt I made is meant as a memory of this very special day on December 12, 2012. It is based on a cartoon made by Peter. The cartoon was enlarged and divided in 20 pieces. All members of the KadK group where then asked to make a creation based upon a part of the drawing (prepared on a fixed canvas; the artists did not know what the complete picture was). 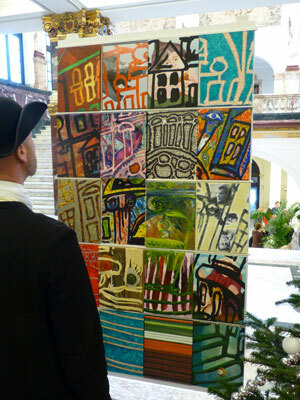 The result was a very colorful and dynamic painting, showed on the Wedding day and sold by auction.The March exhibition was in the former Mariaschool in Heemskerk , where nowadays cultural and creative projects and negotiations are housed. Creations dedicated for this occasion were based on the theme ‘Virgin Mary’. 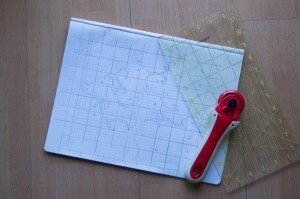 It took me some time before the idea for my project ‘popped’ in to my head. I did not want to come with a traditional Madonna figure, and thought what was specific for the person Mary. 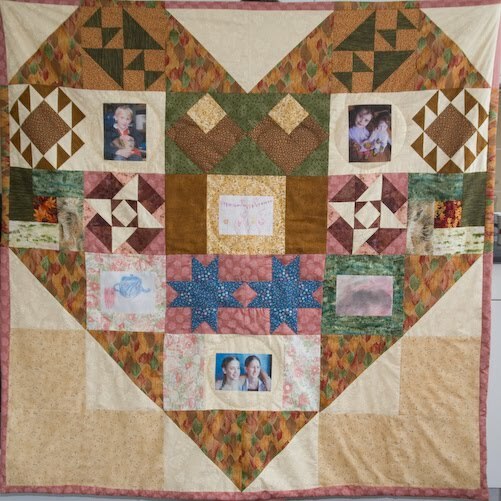 She lost her child, and knowing how much sorrow this is for a mother, it brought me the inspiration for my mini quilt: Mary’s Tears. 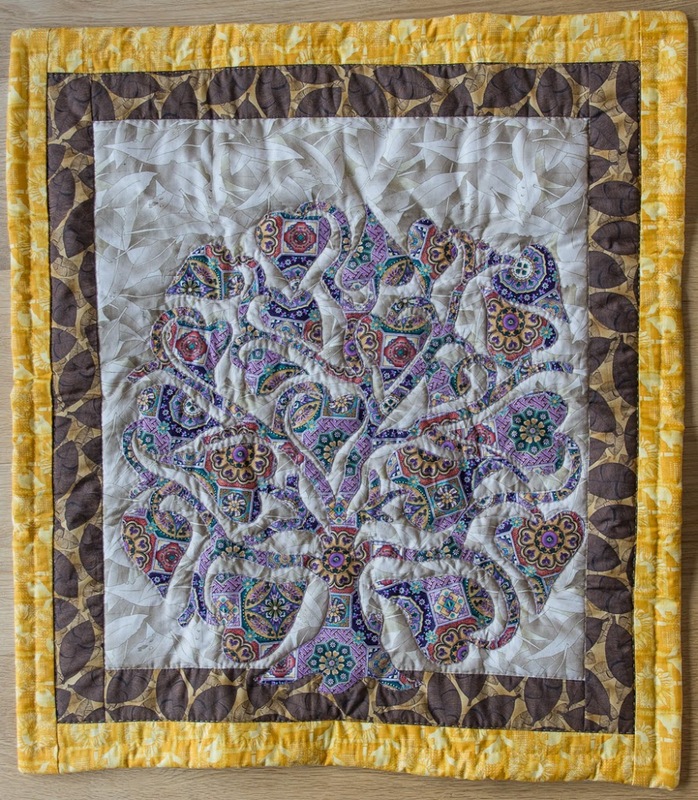 The tears and flowers are made by hand applique and this is my first quilt where I combined traditional quilting (a feathered border) with free quilting by hand and I am quite satisfied with the result! In June, Florian gave his Master Recital on Bassoon in Codarts, the Rotterdam Conservatory. We were invited to attend his ‘proof of principal’ on June 20th for the Exam Committee. He passed (of course) with a special compliment for his artistic leadership. This is a short impression of the start of his concert – in a darkened room with only a scarce light for the piano player. 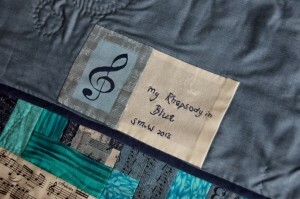 A diploma is the perfect occasion to create a new quilt, and so I worked on and finished ‘My Rhapsody in Blue’. 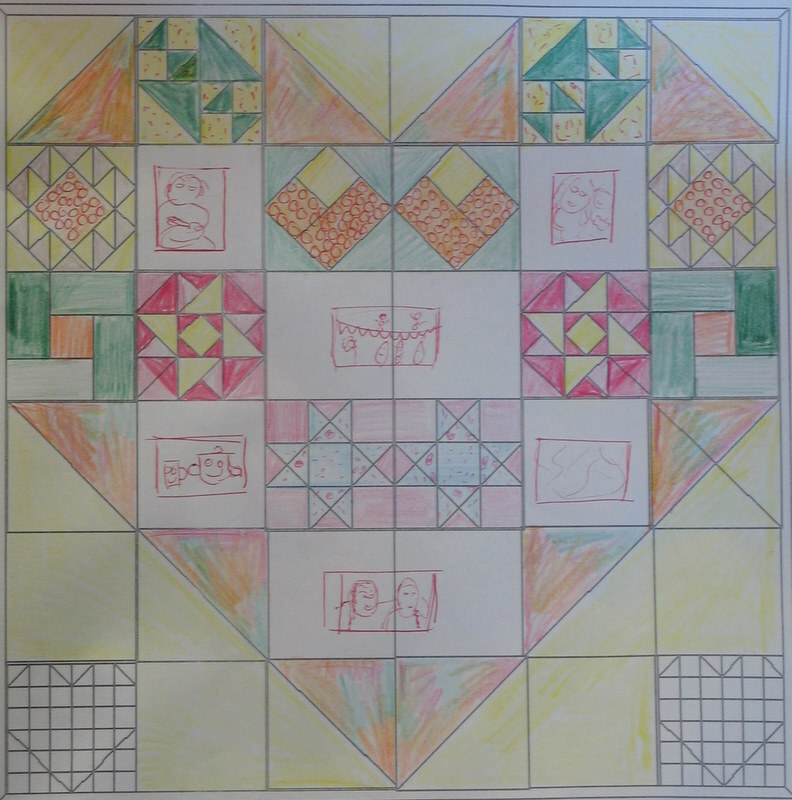 I designed a quilt template with a music key and notes for the borders, and Florian and Leonore were quite happy with the result. 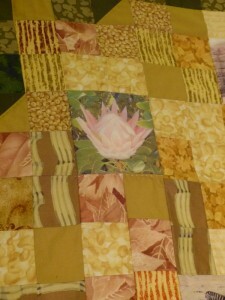 The quilt is hanging in their living room just above the piano. Later this year, the KadK group will have a weekend exhibition (Nov 22-24) in Leiden in the Sidac Studio (www.sidacstudio.nl). The theme of this exhibition is “Music”, what more could I wish for? I have already started with some projects and will keep you updated! Thumbs up! Two days after discharge from the hospital! The year is almost gone…time for some reflection, and definitely time for an update on this blog, since so much has happened this year! Almost immediately after the beautiful wedding of Sanne and Wouter, we were shocked by the message that my Mom had a malignant tumor in her lung, causing severe anemia. Surgery was carried out on September 21st, and only three months later, we can say only one thing: she’s back on track! She was discharged after only 1 week, and has shown remarkable strength and resilience. 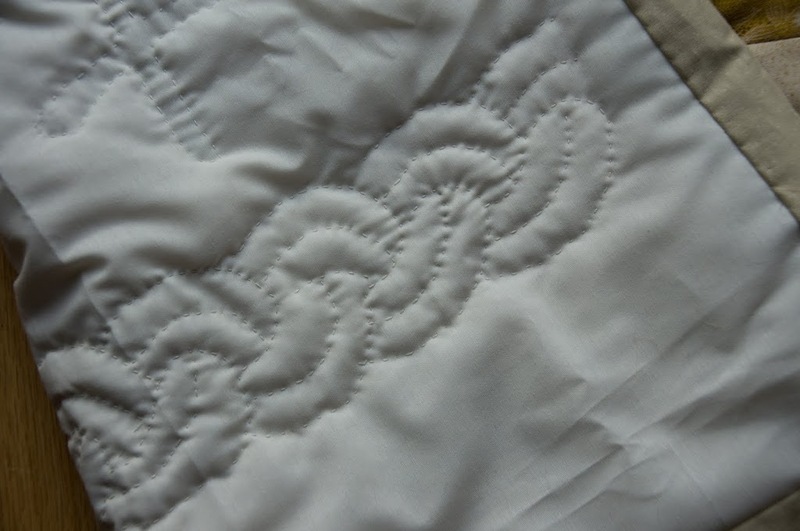 In between hospital visits and preparing for the aftermath there was the marriage of a colleague and the 25th wedding anniversary of my old schoolfriend, so some needlework had to be done. 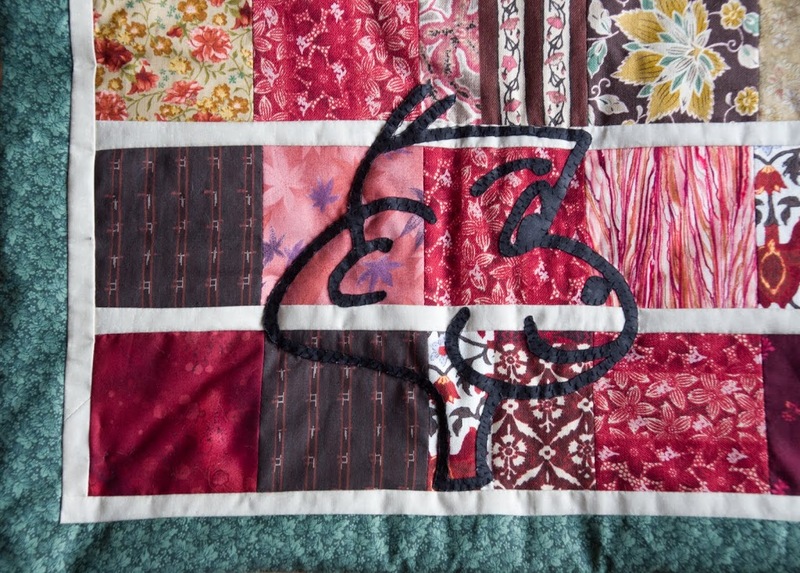 The good thing of patchwork and quilting is that on the one hand it helps me distract, while on the other it helps me to organize my thoughts and really brings peace of mind. 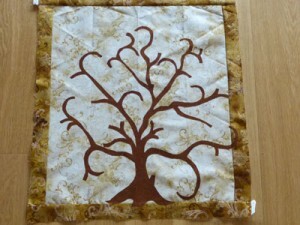 After the Apple tree quilt (see blog: Wedding Quilt), I looked for other ‘treeish’ patterns, since I like the idea of a Tree of Life for this occasion. And I found this Heart Tree by Liz Jones (the pattern can be downloaded from the AQS website). 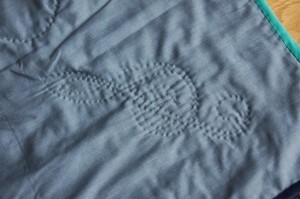 It was quite a challenging pattern, but I love the result, don’t you? 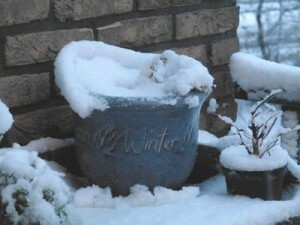 Before I could think twice, Autumn was over and Winter arrived all of a sudden. Winter in the Netherlands usually means a chaotic day with traffic jam, trains no longer running, and the opportunity for a snowy picture. The next day everything is back to normal and Winter forgotten. But staying inside, due to weather conditions, gave me the opportunity to get ready for Christmas and with a loads of seasonal fabric in stash I decided to make baskets and filled them with chocolate as a small token of appreciation for family, friends and colleagues. Today, on December 25th, the temperature is almost 10° Celsius, with showers. We are enjoying our time together at home after spending Christmas Eve with Leonore and Florian, visiting my parents in the afternoon and looking forward for Sanne and Wouter arriving tonight. Despite all the turmoil in the past months, I have the feeling that the New Year will bring lots of opportunities in work (finally finishing the dissertation! 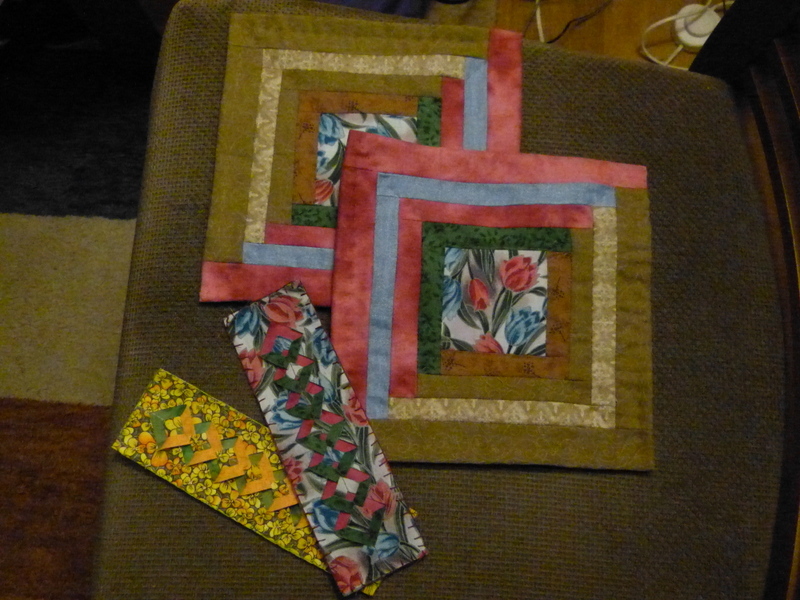 ), family life and quilting. 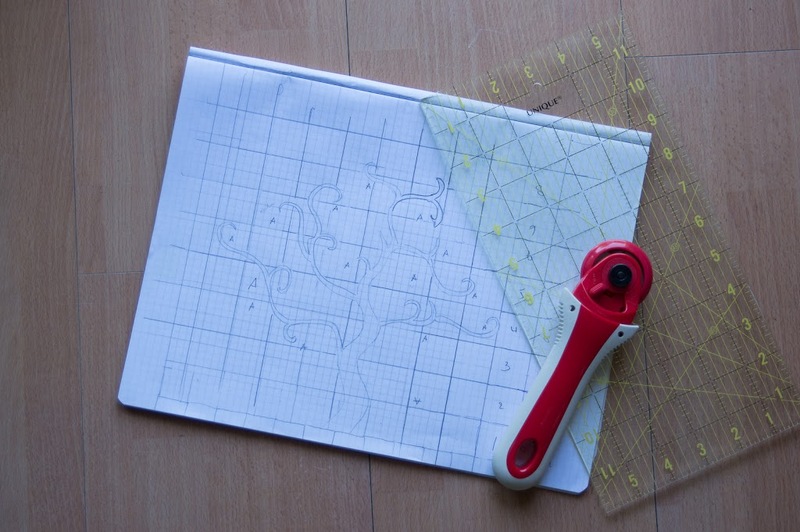 There is a new project on the go, and I will tell you more about it as soon as the first bits and pieces are ready. Happy Holidays and Best of Luck in 2013! KadK project 121212, the challenge for 2013! A Wedding Quilt, but different. 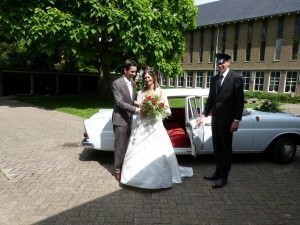 Less than a year ago, my daughter Sanne and her friend Wouter announced their wedding plans for June 23rd, 2012. 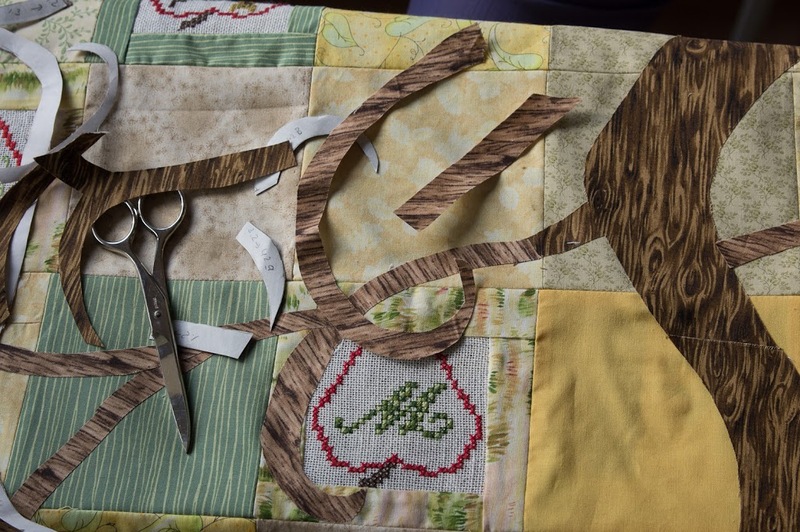 You could say there was enough time for the design and making of a wedding quilt, but the final idea was born just before we left for our trip to Australia in April/May. 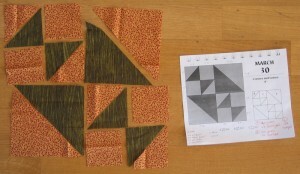 It was decided that it should be a family project, not only joining the efforts, but also multiple techniques. 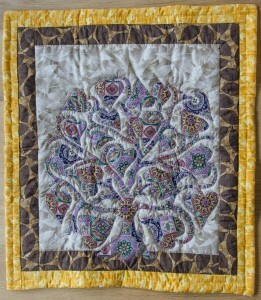 Patchwork, applique, cross-stitch and quilting were combined in a contemporary wedding quilt. 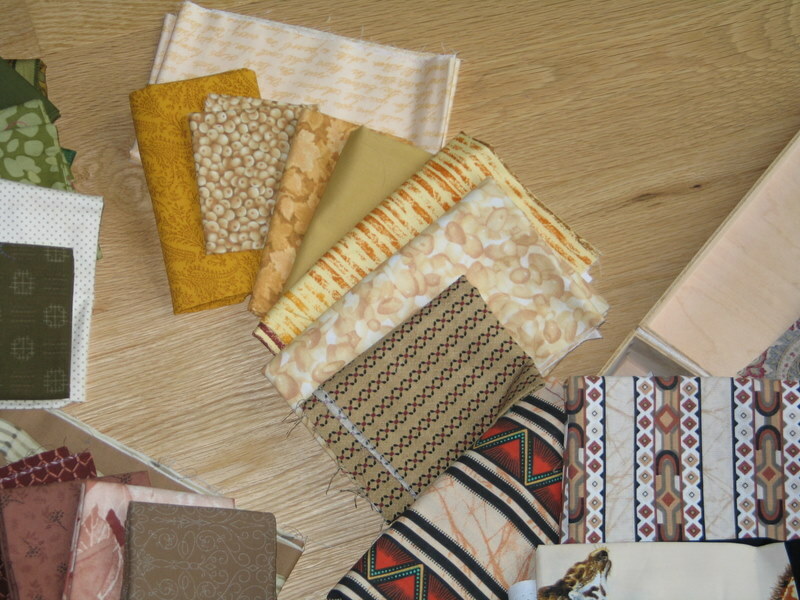 My mom and daughter Leonore were involved in the process of choosing the colors and during my trip ‘down under’ I found the perfect fabrics.My brother in Canada and his daughter Julia were invited to make some stitches as well. The idea was to make a tree filled with apples, each apple containing a little symbol or figure characteristic for the happy young couple. 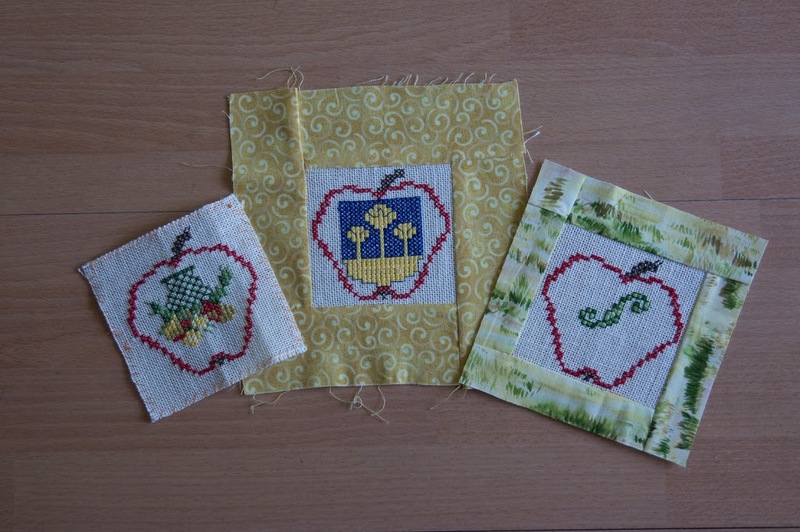 All apples were bordered with the fabric of the top and fit into the correct spot, as is shown on the apple tree map (left picture; A is for apple…). 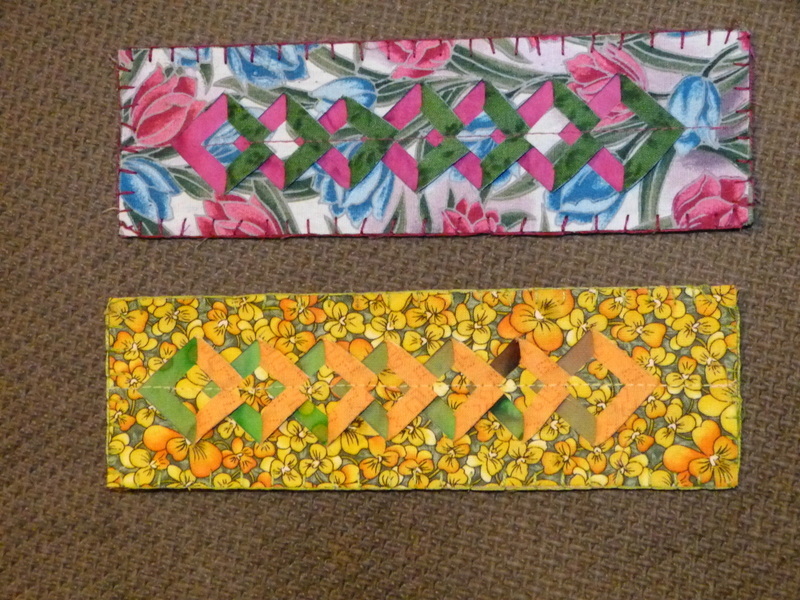 All the fabric for the top was cut, but I could only start putting them together, after the apple-stitch project was finished! The tree itself and the foliage were made by applique; the drawing was copied on fusible web, ironed on the top and anchored with little embroidery stitches. This part was done in group sessions, which gave us also the opportunity to practice the songs we prepared for the wedding. 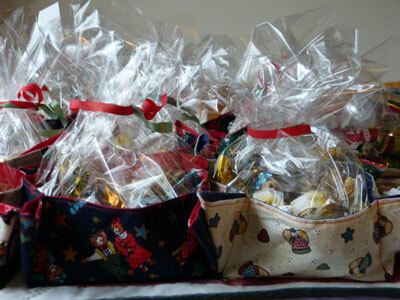 Oh, the best fun is preparing for a party, with all the secrets and surprises! Working together to get this project finished! With Leonore….. …… and my mom! 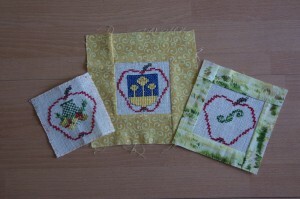 Five left-over apples were put together in a separate border that was attached with ribbons under the quilt. On the other side, the names of everyone who had participated in this project was embroidered by my mom. 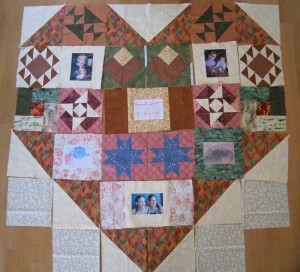 After finishing the top, I quilted a chained heart border. June 23rd, 2012 was a lovely sunny day. After weeks with too much rain, this really was special, but definitely what the bride and groom deserved. After a beautiful ceremony in the Town Hall of Wageningen, where Sanne and Wouter live, we had a day filled with joy and happiness. Lots of friends came to congratulate the happy couple and in the evening, after a lovely dinner, it was party time! That was only 3 days ago; it is amazing how time flies, I am sitting on my couch and wondering what my next project will be…. 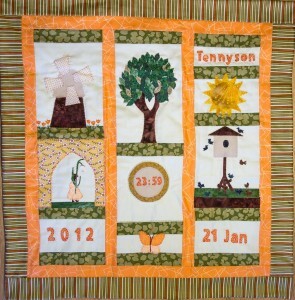 A Quilt for a Baby. Although it is sometime ago since my last blog, it does not mean I have not been working on some projects! 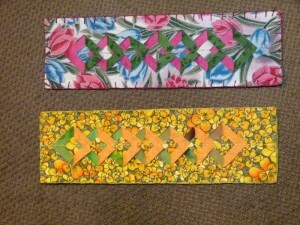 Currently I am preparing some patchwork bookmarks (using Ami Simms’ double-diamond pattern) as give-away’s for some upcoming trips, using fabric with Dutch flowers (tulips and daphodils). 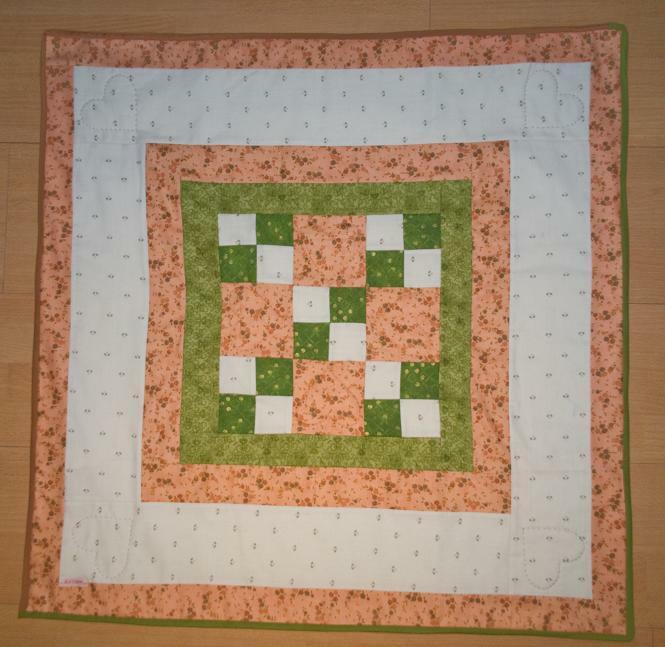 Whenever the (future) arrival of a new baby is announced, I immediately feel the urge to start a new project: a baby quilt is always a nice project to work on, it has a clear deadline (the due date) and furthermore it is challenging to work with the colors that the soon-to-be-parents have chosen for their newborn. I remember one Summer during the time that I was working in the pediatric stem cell unit, 5 nurses were pregnant and I made them all a little quilt. 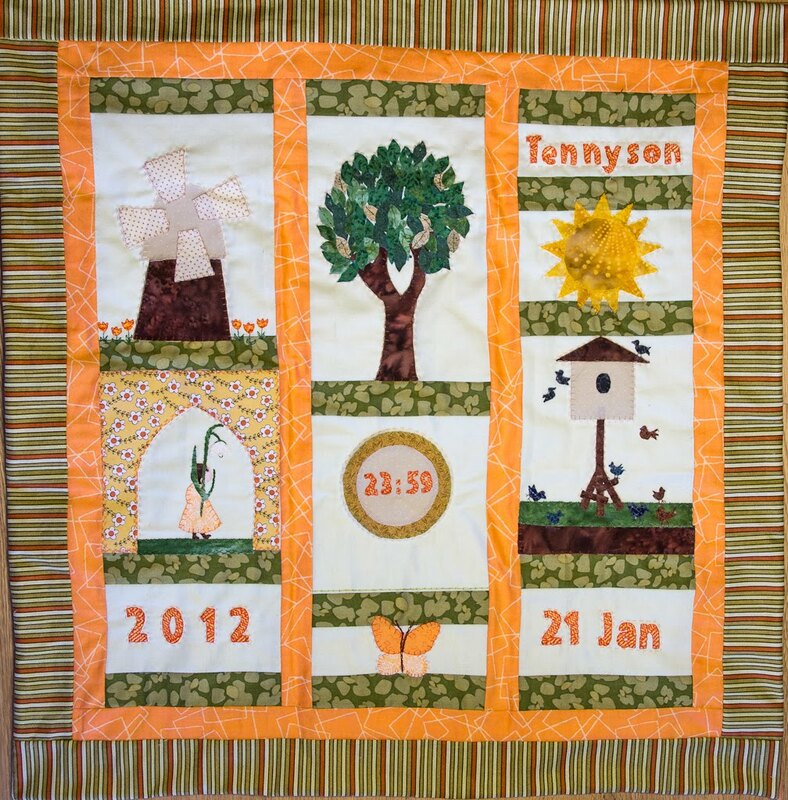 But the last baby quilt I made was different, it was for one of my best friends, and the day the little girl announced it was time to be welcomed in the world, we were online, chatting for about an hour, since she does not not exactly live around the corner! It was very special, and I will never forget these moments, although she was thousands of miles away, it felt if we were in the same room. The colors she had chosen for her nursery were green and orange, and although I guessed about the exact shades, in the end it seemed to fit pretty well. 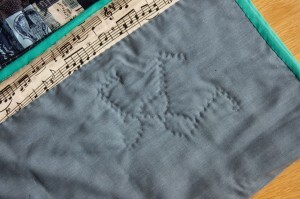 I choose for typical Dutch symbols in applique, like a mill and tulips combined with the facts of the newborn, composing a small sampler. Another project finished! Some colleagues are special and deserve a quilt for their special occasion. Carla was involved in Europdonor Foundation from the very beginning as office manager, personal assistant for the director, and jack-of-all-trades for the donor center, keeping an eye on the stem cell donation schedule. She kept all the historical facts in her head or in her archives. She was our living wiki with knowing all the ins and outs and who’s, what’s, and where’s of stem cell donation. She will retire in January 2012, and we had a farewell party last Friday. 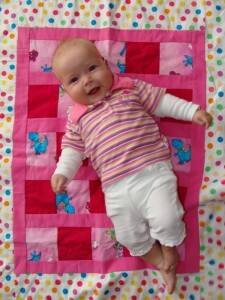 That I would make a quilt for Carla was a matter of course, but the implementation took me more time than expected. 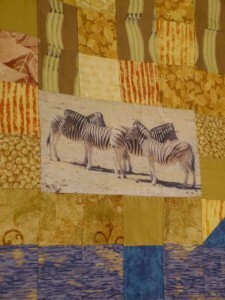 Oh, the theme for the quilt was easily found: Carla loves Africa, and has traveled their a couple of times. 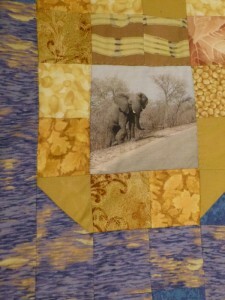 But how to process this theme into a quilt in an original way? Every time I was thinking about a design, I heard Carla’s voice somewhere in the back of my head: ‘don’t forget, I am very critical’. 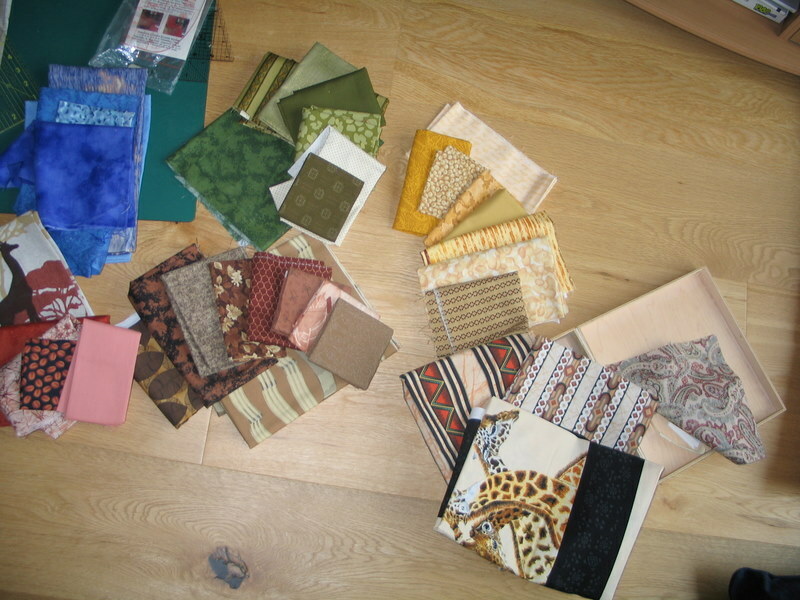 I selected and deselected fabrics for hours. 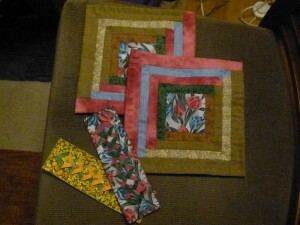 I thought of traditional blocks, but decided for something less stringent. I asked Carla if she would like to have her own Africa pictures processed in the quilt; she gave me a CD with photo’s and I choose six of them that found their destination on the map of South Africa. 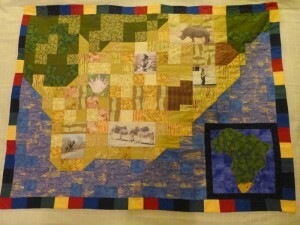 Little by little, step by step, the ‘Forever Africa’ quilt was born and developed over the past weeks. 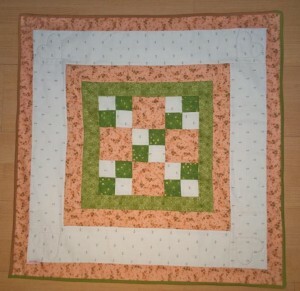 For the borders I decided to use the colors of the South African flag, using simple solids. 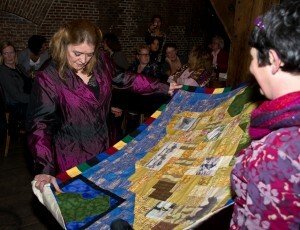 The evening prior to the farewell party I finished the quilt. And Carla? She seemed to be pretty content with the result! It has been raining almost all July, and last night temperatures dropped so much, that it really felt if Winter has decided to return early this year. 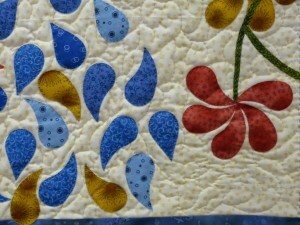 You might think that rainy days in Summer are the perfect days for quilters. But sometimes my work is too busy and I am not able to focus on my UFO’s or start a new project, because there is work to finish that I brought home from the office. To avoid loosing the quilting bug (which seems to be impossible, once contaminated), I like to visit blogs of other quilters. 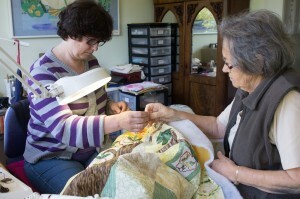 The American Quilter Society can be followed on Facebook there they announce their ‘blog-of-the-week’ winner. 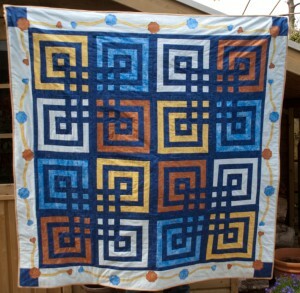 This week Julie Letvin’s http://www.quiltjewelry.blogspot.com/ is the lucky winner. 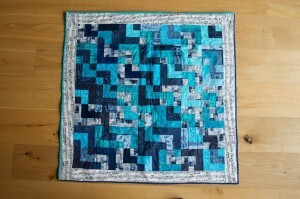 I visited her blog and was so surprised with what I saw. She makes the most beautiful miniature (and I really mean ‘miniature’, with a size of 1-2″!) 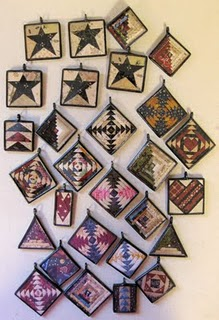 patchwork pendants and pins. I was even more surprised that she decided to give away some of her pieces. 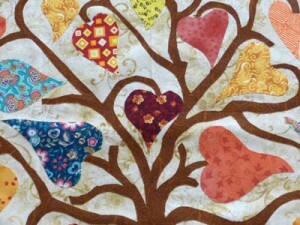 It was not difficult for me to choose from her stash (the 1 1/2″ pineapple heart in pink, purple an cream batiks). 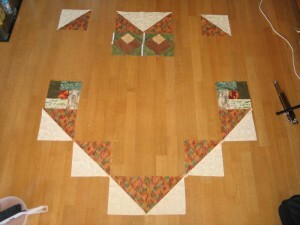 To give you an idea I have copied this picture from Julie’s blog. 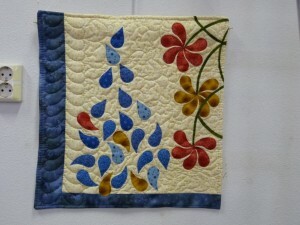 Reading other quilters blogs gives inspiration for new ideas. 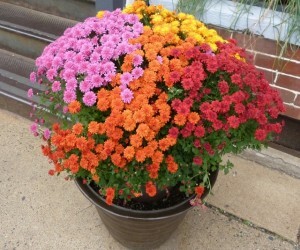 But there’s more blogs that I like: and one I particularly like to read is http://momentswithmotherculture.blogspot.com/. I met Karen and her husband at breakfast, when Jack and I were in Flemington on our trip from Pittsburgh to New York. We stayed in the Manor House on Main street, a very nice B&B in an old Victorian house. 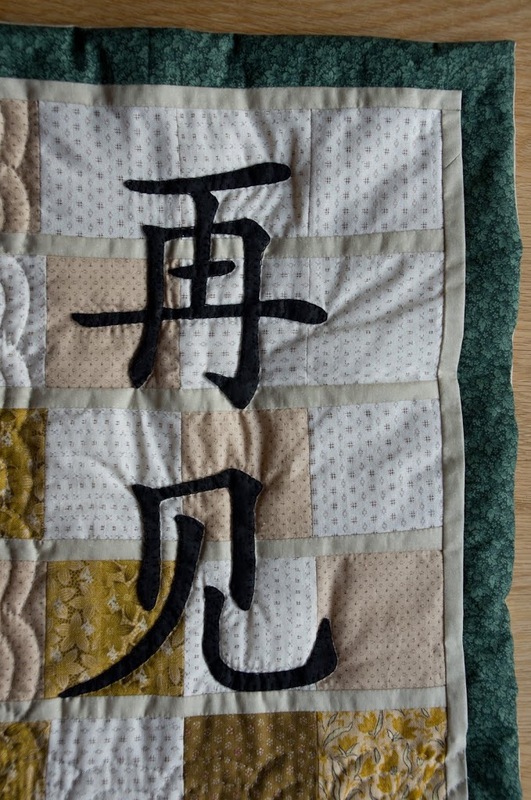 Karen’s posts are so nice to read, about the daily things in her life, (often about her knitting or embroidery projects), but always with a lesson or advice in a very pleasant way. If you are interested in our trips, you can visit our travel blog http://tripsandtravel.netau.net/. Our next trip will head ‘down under’ next Spring: yesterday we picked up some information at the local travel agency, so we can start preparing. 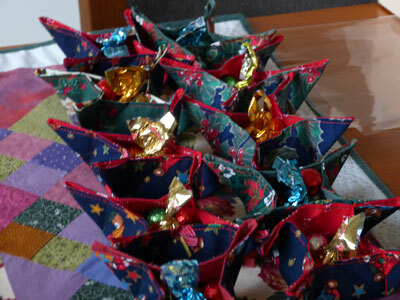 And preparing a trip is one of the nicest things to do (besides quilting, but that’s obvious!). Enjoy the rainy days in Summer! 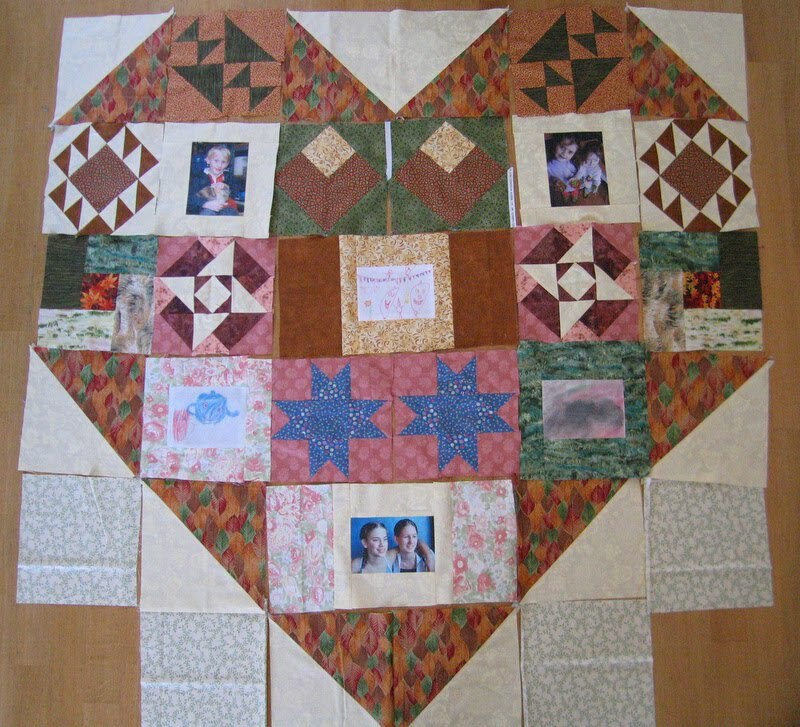 I love to make quilts for a special occasion, in particular memory quilts, like the Europdonor quilt that I showed you before. 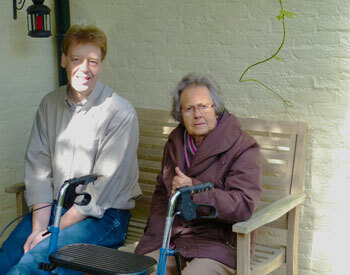 In 2007, my parents celebrated their 50th Wedding Anniversary, a Golden Wedding. 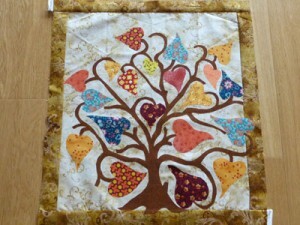 With the help om my daughters Sanne (colors) & Leonore (design), I made ‘A Golden Heart’. 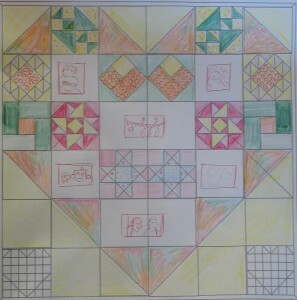 It was quite a project that started with the choice for a main block: We choose to increase the ‘Watercolor heart’ block ( from Nancy J. Martin’s perpetual calendar 365 quilt blocks a year, Feb 15) and filled the blocks with pictures and drawings of the grandchildren, printed on fabric, and other blocks that we felt were resembling my parents. After the choice for the blocks and the fabrics, the second part of the journey began: cutting pieces and fitting them together until we were all happy with the result. 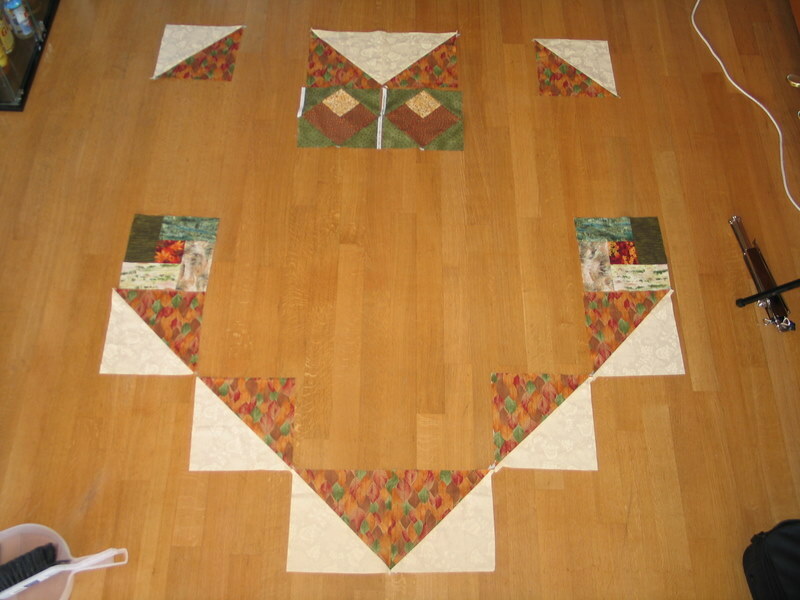 Our living room floor was more than once covered with blocks, pieces of blocks and one of us crawling around, trying to do some jigsawing with fabric pieces. What started with piles of fabric, started to look like a real memory quilt, and during a nice party, two of the younger grandchildren offered it to Oma & Opa. Needless to say that they were very surprised. 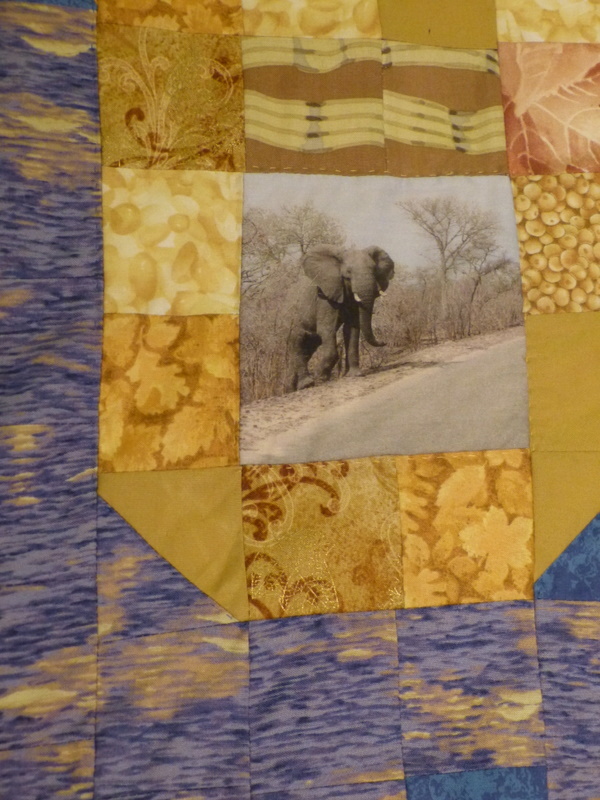 The quilt is now covering my father’s grand piano in the heart of their living room. 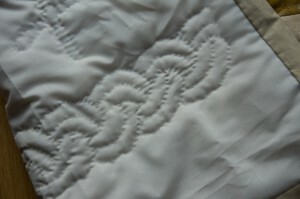 Every time I see it, it makes me smile and brings back the memories of this nice quilting journey. The project I finished this week started just a couple of weeks ago, when I learned that my colleague John Lie, after almost 20 years, had decided to leave Europdonor. We have been working together, performing donor searches for Dutch patients in need of a stem cell transplantation, since 1997. He taught me everything about matching, and we talked about family, and food, and the assortment of our ‘Sweets and Soup Shop’ (a little table in a corner of our office with chocolate bars, sweet treats and noodle soup and a small cup for the payments for our Europdonor colleagues), and became friends. 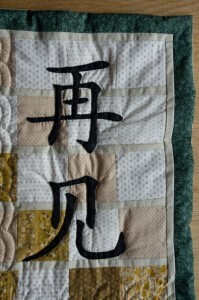 Since John’s roots are Chinese, I decided to make a quilt with an appliqued chinese character, meaning: See you, good bye! 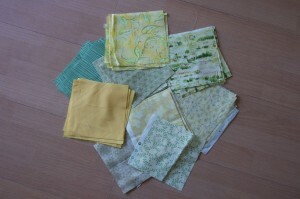 I have chosen for fabric from Japan, bought in the City Quilter in New York, mixed with matching fabrics from my stash. When I was stirred up by something, John always stayed imperturbable and often said to me: ‘be careful, you have too much fire’. 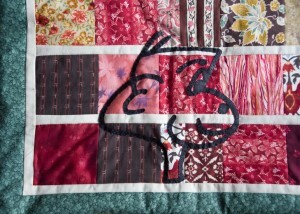 With this quilt I have donated him some of my fire. John loves monkeys and is concerned about their well being, see also: Stichting Aap. 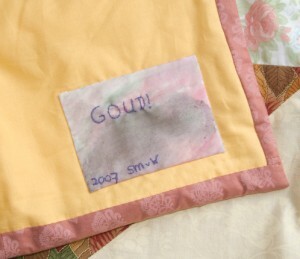 The little monkey is part of John’s signature: Jocco Aap. 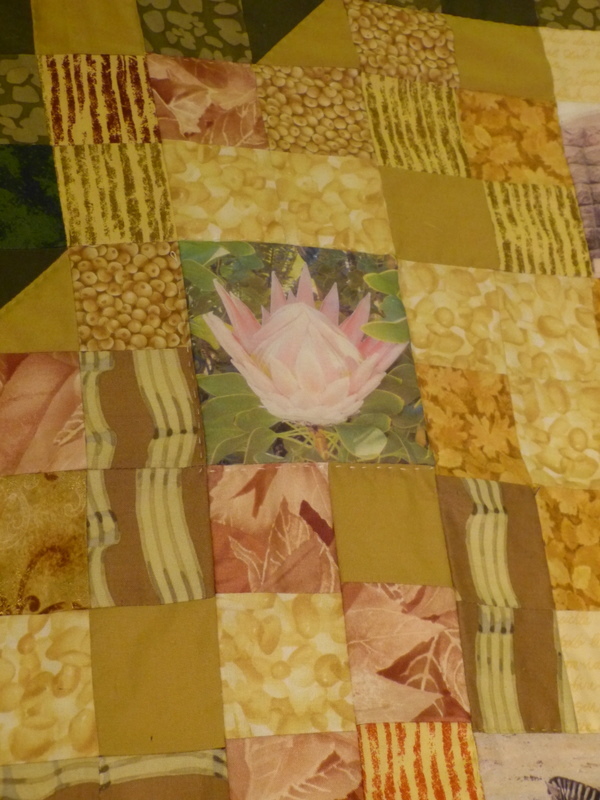 It is less than 2 years ago, that I finished this quilt. 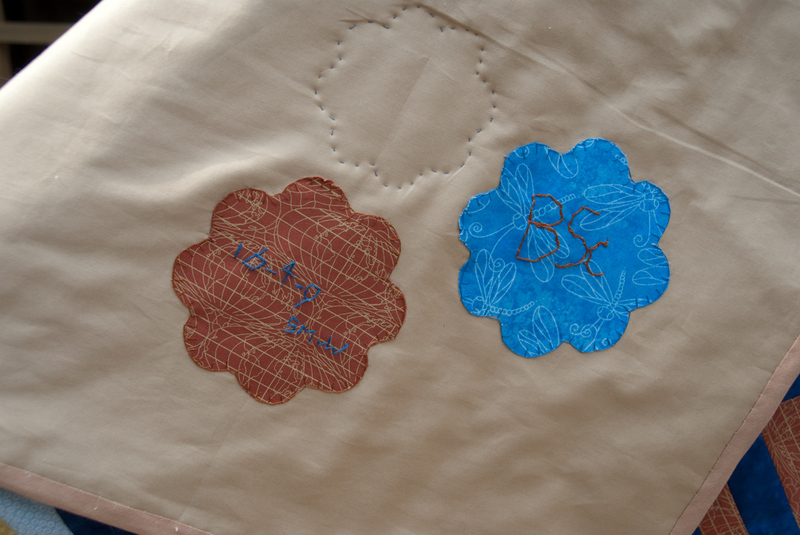 It was made on the occasion of the BSc of my oldest daugther Sanne and her friend Wouter. 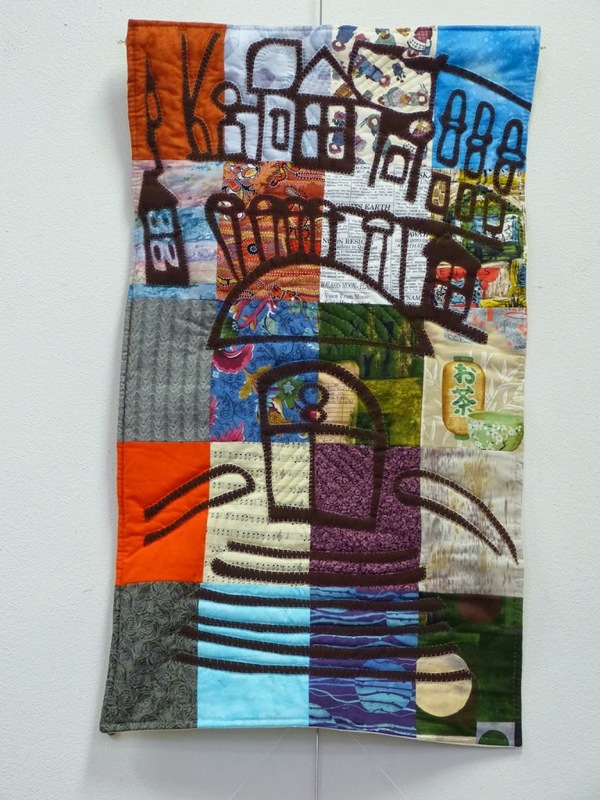 It is hanging in the living room of their apartment in Wageningen. 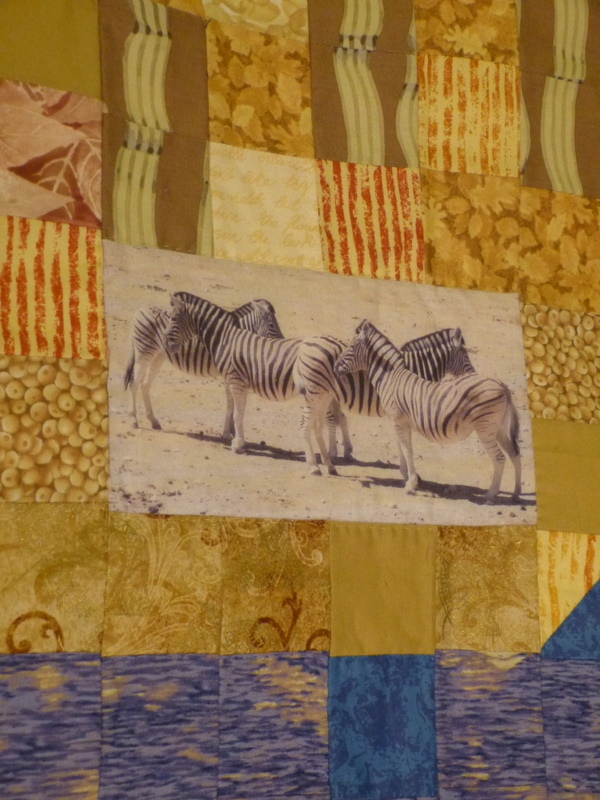 During our trip in British Columbia (CND) in 2008, Sanne saw this quilt in a shop near Radium Hot Springs, where we stayed a couple of days, and immediately loved it. 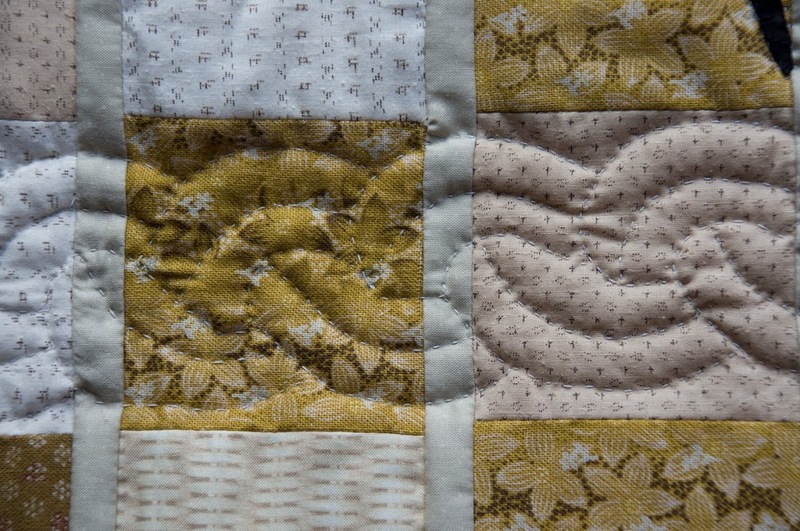 We took a picture with Leonore’s telephone, and during my stay in Minneapolis later that year, I found the perfect fabric for this quilt. Only 3 weeks ago, Sanne graduated from Wageningen University and is now a Master of Science in Spatial Planning. And if that is not enough, she entered the PhD program. Needless to say that her mother is very proud!